Entries from Digital Intelligence tagged with "safari"
For the first time, Apple will allow adverts to be blocked by the iPhone and iPad versions of Safari, in a move is likely please users, but will concern both advertisers and publishers alike. In what could be a major blow to the ad industry, the next version of Safari will let users block ads on iPhones and iPads. Google has lost its attempt to get the lawsuit alleging it bypassed settings in Apple's Safari web browser thrown out of a UK court, as the digital privacy battle continues. Google has been forced to pay $17m (£10.5m) for tracking Apple's Safari browser users without their permission. Google is being sued by a group of web users in the UK for undermining the security settings on Apple's Safari browser to track online usage covertly. Google has been fined $22.5 million by the Federal Trade Commission (FTC) in the US, for breaching the privacy of Safari browser users. The privacy case revolves around allegations that the search giant deceived millions of web surfers using Apple's Safari web browser into believing their online activities could not be tracked by Google provided they did not change the browser's privacy settings. Apple is removing Oracle's Java software from browsers on its Mac operating system, as part of its latest software update. The move means that Apple users that use the updates Mac OS update will need to download Java support from Oracle directly. Java is a computer language that enables programmers to write one set of code to run on virtually any type of machine. The largest fine ever levied against a company by the FTC has been drawn this week up against Google for their breach of Apple’s Safari web browser. Worldwide Internet Explorer usage has fallen below 50% if mobile and desktop browsers are both taken into account, according to new research. The study, from web analytics tracker NetApplications, showed that IE accounts for 52.63% of all desktop browsers. That's down from 54.39 percent in September and 60.99 percent in October 2010. Google's browser Chrome is taking an increasing share of global Web usage, while Microsoft's market leader Internet Explorer is in decline. 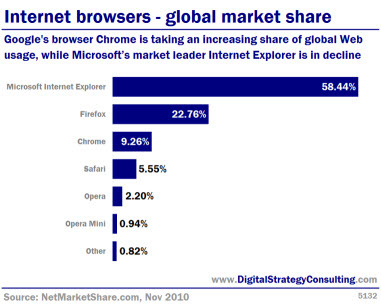 Internet Explorer's share of the worldwide browser market has dropped below 50 per cent, according to new data. According to StatCounter findings, in September, the Microsoft browser's market share was 49.87 per cent - down from 58 per cent this time last year. It has even dropped to 40 per cent in Europe, yet IE still narrowly dominates the market in North America at 52.3 per cent. This fall has been coupled with a rise in both Firefox (31.5 per cent) and Google Chrome (11.54 per cent). Chrome has jumped from 3.63 per cent this time last year. Microsoft is to give IE users the option to switch to rival browsers, including Firefox, Chrome, Opera or Safari, as part of new competition rules.The move follows a legal agreement between Microsoft and Europe's Competition Commission in December 2009. Starting from March 1st, Microsoft will let Windows PC users across Europe install the web browser of their choice, rather than having Microsoft IE as a default. Figures suggest that over half the world's internet users have IE. Testing for the update is already underway in the UK, Belgium and France. Possibly one of the fastest downloads in history. Mozilla's new Firefox 3.1.11 browser clocked up a staggering 150m downloads in its first 24 hours, writes VNU. Apple's Safari is logging a more sedate 11m for Safari 4 (over the first four days).